In 1858 Frederick Law Olmsted and Calvert Vaux began work on the 843 acres of city land that would become The Central Park. Their ambitious “Greensward Plan” encompassed formal promenades, rustic lanes, romantic buildings and ornamental lakes and lawns. A year later construction began on the dramatic Bethesda Terrace and Fountain. The panels of the Terrace were covered in intricate carving, organized in motifs of the Seasons, the Ages of Mankind, and the Times of Day. A team of sculptors was hired to work on these panels and the men were given unexpected independence in their carving. Among them was Scottish-born Robert Thompson. 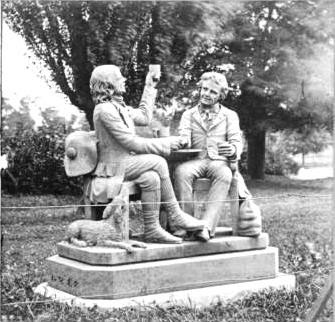 The sculptor created Burns’ two characters, Tam O’Shanter and Souter Johnnie, out of soft yellow sandstone. Much in the style of the popular contemporary sculptor John Rogers, whose work graced the parlors of middle class homes across the nation as plaster casts, “Auld Lang Syne” was a snapshot of everyday life. The grouping made no attempt at Victorian formality or propriety—it depicted two old acquaintances raising a glass in the company of a faithful dog. Indeed, there were “sons of Auld Scotia” who would purchase the group, although not until 1866. 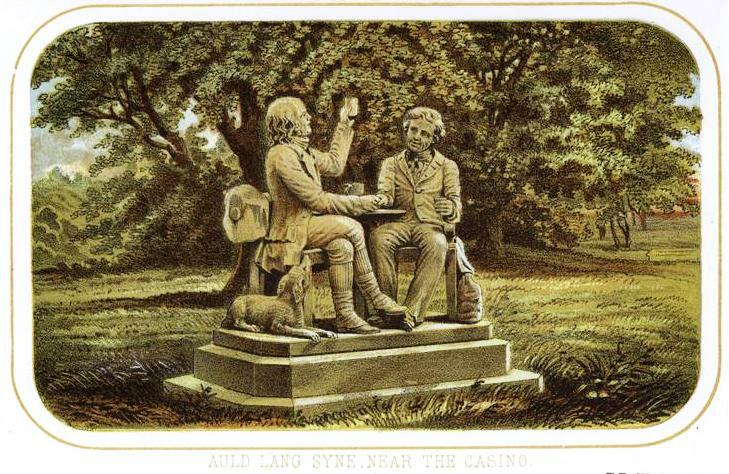 The New York Star Almanac later reported that “A committee of gentlemen representing the Scotch residents of this city presented…the life-size group of ‘Auld Lang Syne,’ illustrative of the characters of Burns’ celebrated song." The group of Scotsmen presented the sculpture as a gift to the City to adorn the new park. 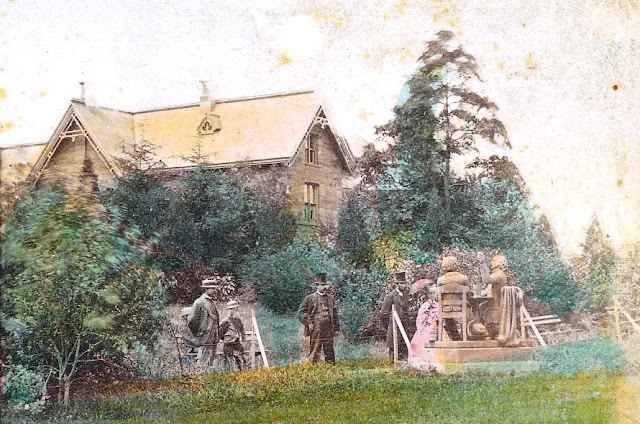 A hand-colored stereopticon slide shows a rare rear view of the sculpture with the Casino in the background. Thompson’s work was placed along a winding path off Fifth Avenue, very near the Casino. Designed by Vaux, the Casino was a refreshment spot where hot or weary strollers could rest and enjoy a cool beverage. 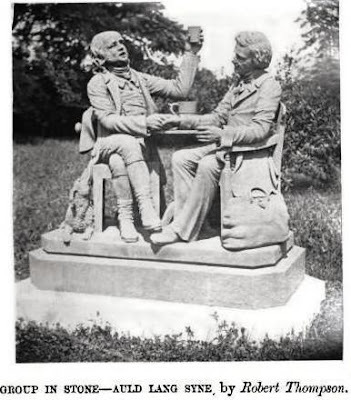 The theme of the sculpture was, therefore, somewhat appropriate—albeit the realistic representation of the two beer-drinking cronies may have been a bit offensive to some of the proper Victorian ladies. If “Auld Lang Syne” offended some ladies, it was adored by other groups. For the Scottish immigrants, it was a reminder of home. When a new arrival landed, he was almost immediately taken to Central Park to see the statue; or at least given directions to its location. Stereopticon views of the work were sold by the thousands nationwide. But rapidly the statue began deteriorating. 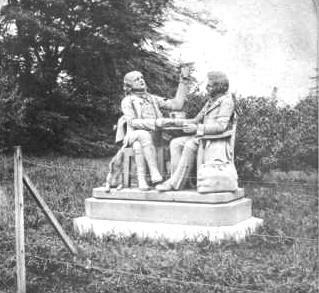 The sandstone, called “New Brunswick stone” by the New York Star Almanac, was easily eroded by the elements and only a few years after its placement the statue was noticeably disintegrating. To save the work it was removed to the Art Hall of Mount St. Vincent. When Central Park was first laid out the Convent and Academy of Mount Saint Vincent had already stood near 5th Avenue and 105th Street for more than a decade. It was here that Frederick Law Olmsted and his family lived from 1859 to 1863 while he directed the landscaping of the Park. During the Civil War it was used as a soldiers’ hospital. By now, however, the former convent and academy buildings had been converted to a tavern, a sculpture hall and a parks department depot. Here, in the former brick chapel where it was protected from rain, wind and the effects of severe heat and cold, “Auld Lang Syne” would survive for ages. Horse-drawn fire engines galloped to the scene only to find the two hydrants nearby frozen solid. They were thawed by the use of steam from the engines; but it was discovered that the couplings of the hoses were not compatible with the hydrants. By the time the problems were overcome, the fire was well under way. Around 9:00 the ceiling of the former chapel fell in. All the buildings of the Mount St. Vincent compound were destroyed. Although the newspaper gave hope of restoring Thompson’s endearing group, it never came to be. There are rumors that the damaged work still exists, stored away somewhere within Central Park. Yet even if the rumors are true, hope is slim that the sculpture, one of the most unusual and engaging ever to grace the Park, will ever be seen by the public again. Finding background information on Robert Thompson is very difficult. I have an idea that had he not done this particular sculpture he would have been lost to history. Contemporary reports merely mention that he was "Scot-born" and I have had no luck in finding much more. Good luck with you search!